Alcatel IDOL 4S with Windows 10 is the world's first smartphone with Windows 10 Mobile and VR support. 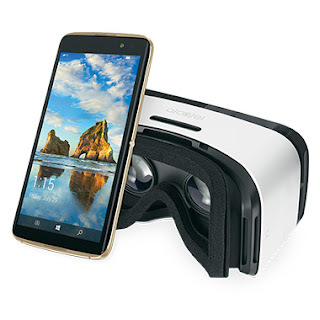 Alcatel today announced the company's flagship smartphone IDOL 4S with Windows 10, available exclusively at T-Mobile, and will include the IDOL 4S VR Goggles. Featuring a premium dual glass and metal framed design, paired with flagship smartphone performance - including support for innovative Windows 10 experiences like Continuum - the device is the accessibly priced flagship that Windows 10 fans and enterprise smartphone users have been waiting for. IDOL 4S with Windows 10 comes loaded with all the great productivity features, including Continuum, which puts PC-like productivity right in your pocket. With Continuum, you are able to seamlessly connect your IDOL 4S with Windows 10 to a second screen, keyboard and mouse for a desktop experience; all while still using your phone. The IDOL 4S with Windows 10 features curated craftsmanship that includes a premium all glass body and halo gold metallic frame, delivering an elegant finish that makes this Window 10 smartphone as smart on the outside as it is on the inside. It's also powered by a Qualcomm Snapdragon 820 processor with an X12 LTE modem, offering unparalleled performance, smooth multitasking experience. and the most advanced LTE and Wi-Fi capabilities available. Combining incredibly vivid pixel quantity and quality, synchronized, high-resolution audio, immersive 3D audio and the most natural feel possible with precise motion tracking and minimal latency, all the features of the Snapdragon 820 processor work together to help deliver a superior mobile virtual reality experience. When it's time to escape reality, the equally powerful IDOL 4S VR Goggles are included as part of the in-box bundle with every IDOL 4S with Windows 10 smartphone. Never miss an important moment with the 21MP main camera, featuring a Sony IMX230 sensor on the IDOL 4S with Windows 10. This feature-rich camera also includes fast-focus and a dedicated camera button, to ensure you always capture the best shots quickly. Plus, it captures 4K video at 30fps, so now you can even record great hi-res videos on the go. The front of the IDOL 4S with Windows 10 features an 8MP camera with front-facing flash and 84-degree wide angle lens allowing for better selfies and video calls - even in low light conditions. The IDOL 4S with Windows 10 will be available at T-Mobile stores nationwide for $469.99 (SRP) beginning November 10, and will include the IDOL 4S VR Goggles. Customers who purchase an IDOL 4S will also receive a free 45-day trial for Hulu Plus, as well as an additional 30-day trial for Microsoft Groove music service. They'll also receive a free copy of the Windows 10 Mobile game Halo: Spartan Assault.